Mr. Herbert Barfield, a.k.a "Dip"
One of my new neighbors, Mr. Herbert Eugene Barfield, is actually a veteran Frog Hollow resident whose Grandfather, Rhodie B. McDuffie, was a highly venerated East Point City Council Member in the 1930s, (see newspaper articles to the right and bottom). Eugene’s First Cousin Laura Foust, and her husband Tom, recently welcomed him back into their family’s home just in time to celebrate his 90th birthday! Not many of us get to go back to a childhood home to live. I’ve been curious to know what emotions and memories this move stirred up for Mr. Barfield, or "Dip" as he’s better known. That’s the nickname his uncle Ralph gave the precocious kid who kept dipping into his pockets for change. A trip down memory lane with him recalls a time when everything west of Semmes was forest and springs with water so pure he and his friends would drink it right out of the stream. "Spring 1 was for drinking and Spring 2 was for skinny-dipping," says Dip with a twinkle in his eye. He was a ladies man from the beginning, I’m thinking just like his grandfather, if this old newspaper clip is any gauge! In the 1930s, Dip worked delivering groceries for Ralph Snow, who owned the neighborhood grocery store at the SW corner of Ware & Semmes. Mr. Snow was a shrewd businessman, staying open until midnight on Saturdays, and hiring neighborhood boys to make deliveries by bicycles he'd buy and provide them. Back then, the A&P store at Ware and Church wasn’t open as many hours, so Snow scooped up a lot of the A&P’s business. Left to his own devises, Dip was quite the young prankster and likely had a pretty lively reputation. Like the day he and his friend Billy Lee snuck into the unlocked back door of a neighborhood church and decided to skinny dip in the baptismal pool. 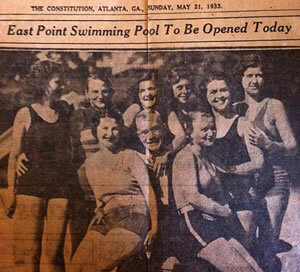 East Point swimming pool on opening day. And the time he helped himself to a local bakery’s cinnamon roll, just freshly delivered to the bakery’s front door stoop on his morning paper delivery route. Then helped himself to a bottle of just delivered milk from the doorstep of the house at Spring and Semmes to wash it down. One of the pranks I won’t mention here, as we have a growing group of urban chicken farmers, but it involved his friend Donald Duncan, who was known as the chicken whisperer. Mostly things were harmless. Kids growing up back then explored the wonders of nature around them for some real 3-D experiences. 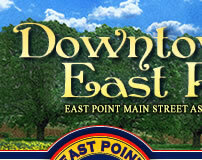 When Dip was older, he worked as an usher at the Fairfax, a movie theatre that was on Main Street. This was back before desegregation. Dip can still remember how African-Americans would pay for their entry at a separate ticket booth and then they would proceed up to the balcony where their seating was. Some of Dip's fondest memories are of working as a carhop for tips every Sunday at Adamson & Pounds Drive-In Restaurant. 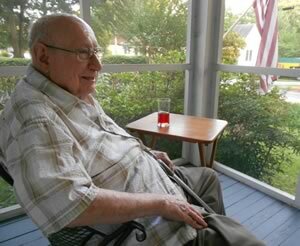 He remembers they had a great cook, Beulah, who made the best Brunswick Stew, still one of his favorite foods, which brought folks from all around. Dip could fill my day with stories of childhood exploits and great restaurants that have come and gone, but I’ll save that for our next porch chat.